Every week, we'll be sitting down with one of our gallery artists to discuss their work, process, inspiration, and stories. This week we're speaking with Lorene Anderson. 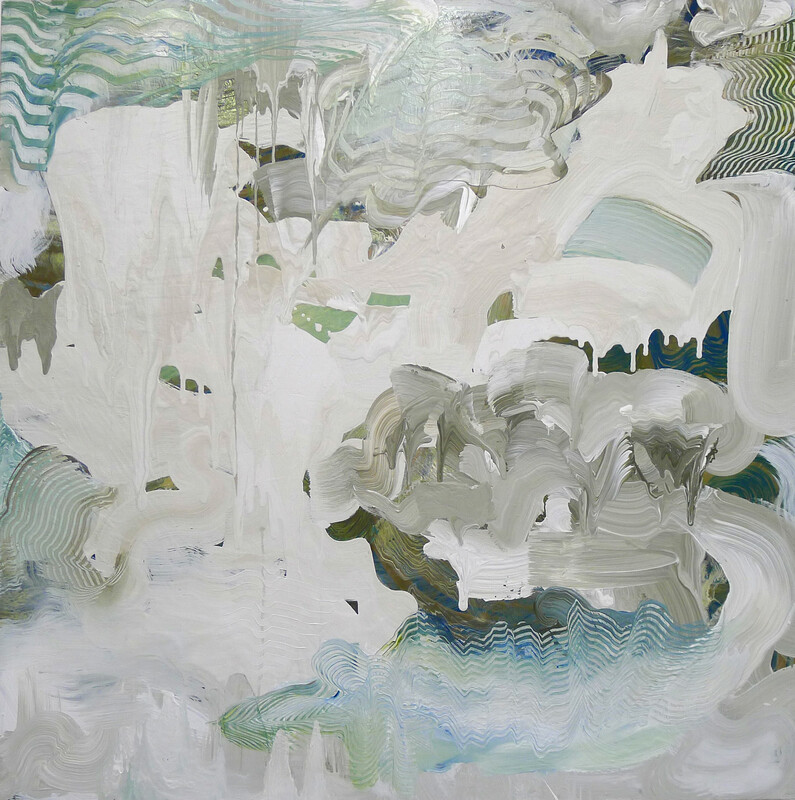 Lorene Anderson's hypnotic paintings are abstracted landscapes influenced by the forces of nature. Characterized by their undulating stripes remniscent of the rolling countryside, they're activated by the phsyical depth of her layering, the vibrating figure-ground relationships, and the engaging conflict of postiive and negative space. 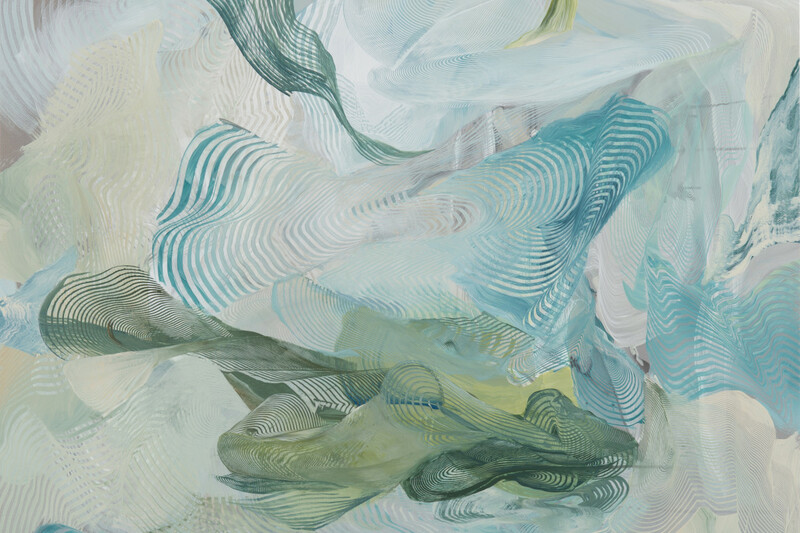 Along with the departure point of landscape, they reference scientific concepts and energies as Anderson strives to translate those ideas into their visual representation. 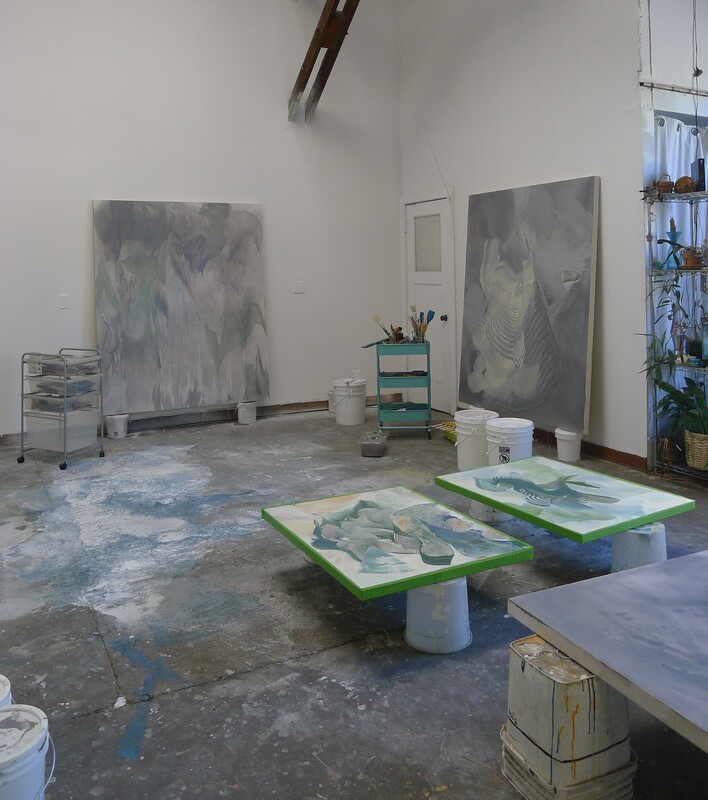 She talked with us from her studio in Oakland, California about why she's drawn to these influences, what's in her toolkit, and the controlled chaos of her process. What are your earliest memories relating to art? When did you start becoming an artist yourself? I was drawing earlier than I can remember. My mother used to buy rolls of newsprint from the town's newspaper to keep up with my drawing. At the urging of an elementary teacher, my parents enrolled me in a Saturday art program for young kids at Columbus College of Art & Design, in Ohio. I majored in painting and metal-smithing at Miami (Ohio) where the art program was rigorous-lots of figure drawing and painting from life. Core classes were based on Josef Albers teaching philosophy, so there was a lot of color theory. Drawing classes especially opened my eyes to what it meant to be an artist and how much work was required to push your work to the next level. I was hooked! Right after receiving my BFA I enrolled in the MFA painting program at UC Berkeley. What was the evolution towards finding your current visual vocabulary like? I try my best to keep moving forward and pushing in my work, both conceptually and aesthetically. I've always explored different ways of mark-making. Years ago I removed the 'hand' and stopped using brushes-I stained, poured, let the paint flow with the direction of gravity. I painted flat, tilting the canvas to get a controlled chaos of runs, drips and lines. I made ink drawings with marbles, I sprayed water on paper and "connected the dots" with ink or paint. When I returned to using brushes I built large brushes so I could get super wide marks. 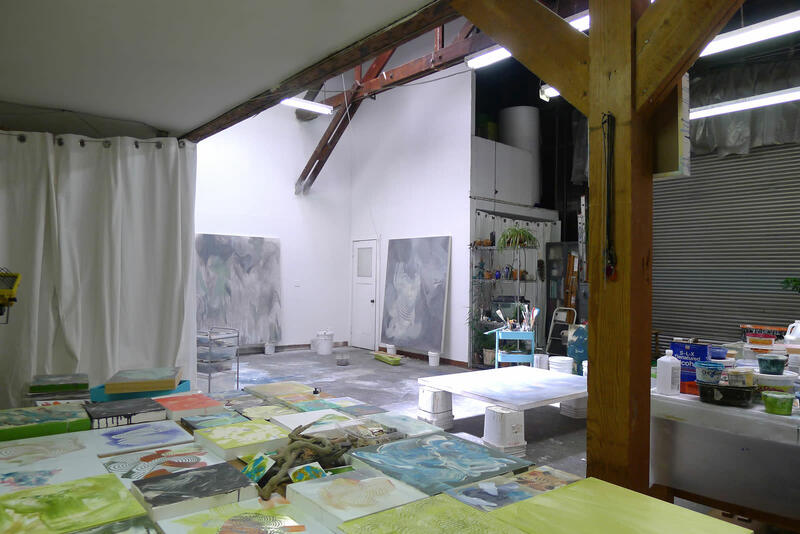 In 2014, I did a residency at La Porte Peinte in rural France. There, I purchased antiquing brushes and scraping and grouting tools in specialty and hardware stores, and started experimenting with stripes, both drawn and scraped. The experience of being in the Burgundy countryside-the stripes of the vineyards and fields of barley, the layers of time and being in a medieval town, literally being on top of layers of history -- fit right in with my fascination with layering of time and space. I continue to use those tools and have found lots of other striping tools, but also make my own tools by carving notches on large squeegees or building large striping brushes. 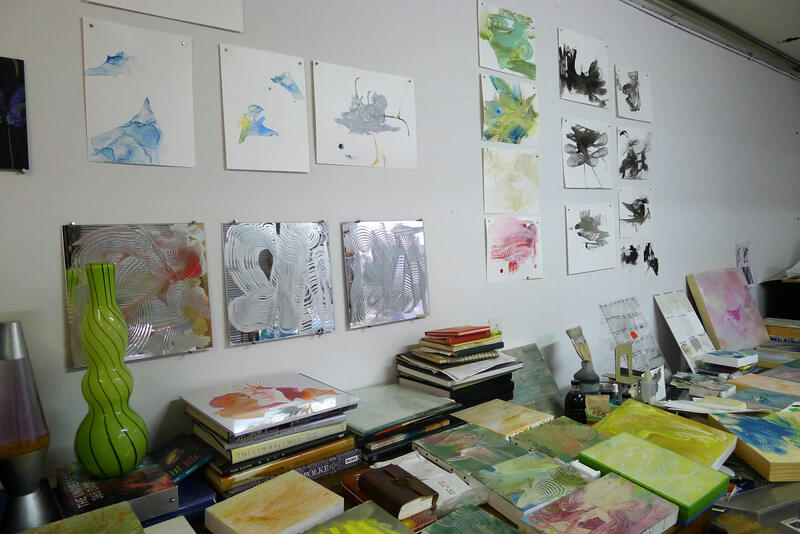 Last March I also did a residency at the Golden Foundation in New Berlin, NY. They taught about acrylic paints and mediums allowing me to take my painting practice further by using materials in a way I hadn't before. I've been using acrylics for 15 years but hadn't tried certain mediums or techniques, many of which are very beneficial to my process. I've also started to experiment by painting & drawing on different surfaces-PVC, mirrors, plexiglass. What is your process? Could you elaborate on how you use your striping technique to abstract landscape? I start most paintings with a wash or stain and build on that, layer by layer. Paintings are worked on while flat. Once layers are dry, I'll put them against the studio wall to study my progress and make decisions about next steps. The new paintings' stripes mimic landscape, but I use the marks to bend the surface into a churning composition, referencing multiple spaces, realities, topology, subatomic particles, shifting light, sound waves. Striping bends space and vibrates the picture plane; there is constant folding and unfolding. The new striated/striped works are linear but I also think of them as a cross-section of layers-some planes are parallel, some intersect. I use landscape as a footing, giving me entry into the reality created on the canvas. The striped landscape is language to exploit, to work with and against. Movement, structure, color, and line are important to my work. I play with figure-ground, sometimes using reflective paints, mostly using scraping and striping to play with the negative/positive. Figure-ground 'vibrates', positive and negative take turns being in the forefront. Lately I've been thinking a lot about edges and playing with how a painting uses them to suggest environments beyond the picture plane. Layers are important, scraping stripes through a top layer of paint reveals another "painting" or space underneath. The marks of the 'scraped striping' become another layer of information. How did the sciences become such a strong influence for you? 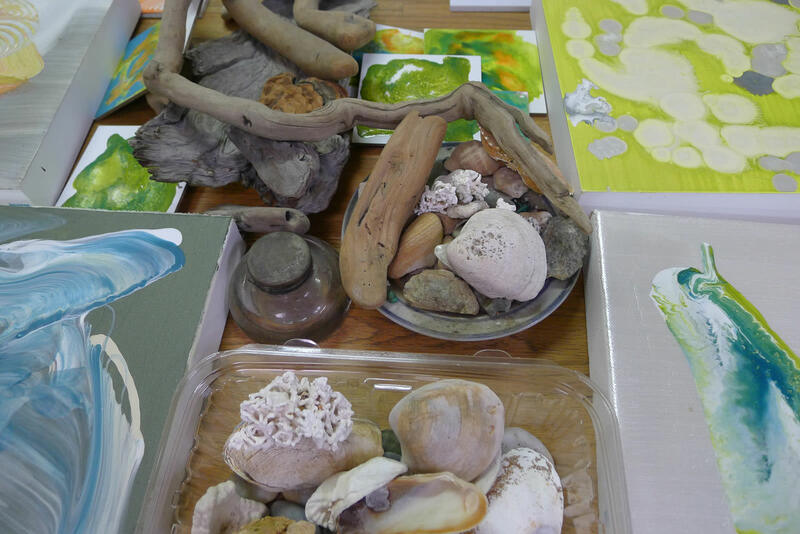 What interests you about exploring these concepts and subjects through art? My family is science-oriented. My father is a retired research chemist, my mother is a nurse, and my sister is in bio-tech. As a kid, I often studied illustrations in various science books on the shelves from my parents' college days. I took science classes in high school and college. While a grad student at UC Berkeley, I had friends in graduate programs in physics, theoretical math, and chemistry. I learned a lot from them about string theory, cosmology, topology. Years later these interests started to affect my approach to painting both in process and concept and I became obsessed with trying to depict these concepts visually. I'm also influenced by marine life-coral, jellyfish, cephalopods. Where is your work going from here? The new work is moving away from landscape-inspiration and returning to more of a math and science inspiration. 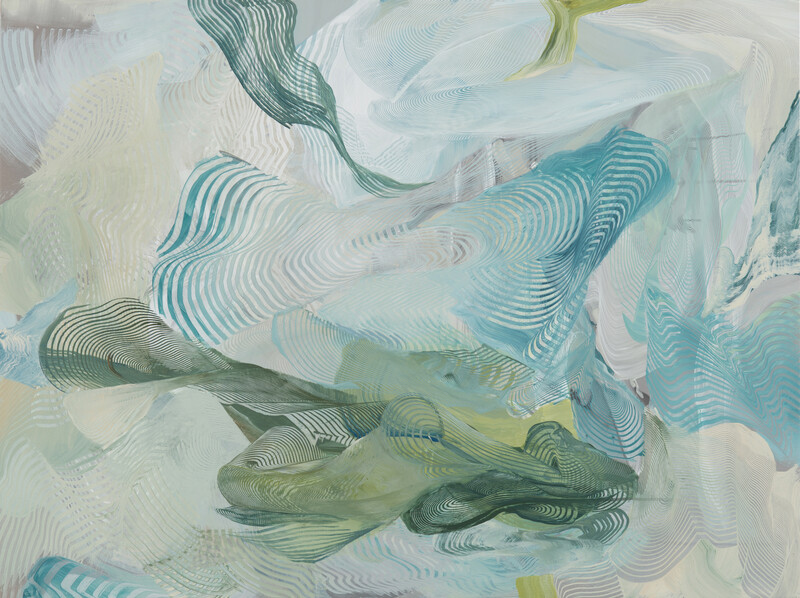 The new paintings are more about exploring movement, turbulence, gesture and how space folds and moves. The work recalls some photographic studies I did years ago; I photographed falling striped fabric that had been thrown in the air in order to explore twisting space, light, and shape. I realized my current paintings are harkening back to that exploration of twisting space so I dug up those (pre-digital) photographs. Some of my new paintings feel like portraits of moving, churning layers. Explore more of Lorene Anderson's work here. Agree, what lovely and alive paintings. Beautiful work what a talented artist.